WHAT DOES A TIMEKEEPER DO? Timing commences from the sight of smoke from the starting gun and concludes when any part of the athletes’ torso crosses the finish line (not the head, neck, arms or legs). Times shall be recorded on the recording sheet to the nearest one hundredth of a second . For example the watch shows 10.18 seconds and this shall be put on the recording sheet as 10.18. The committee recorder will use this data to round the time up to the next one tenth of a second which will be entered in the data base. Thanks to our purchase of timing gates we no longer need as many timers as in previous years. 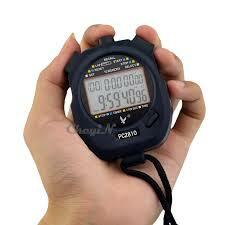 However the more timers we have on the outside track the quicker we can run each event.